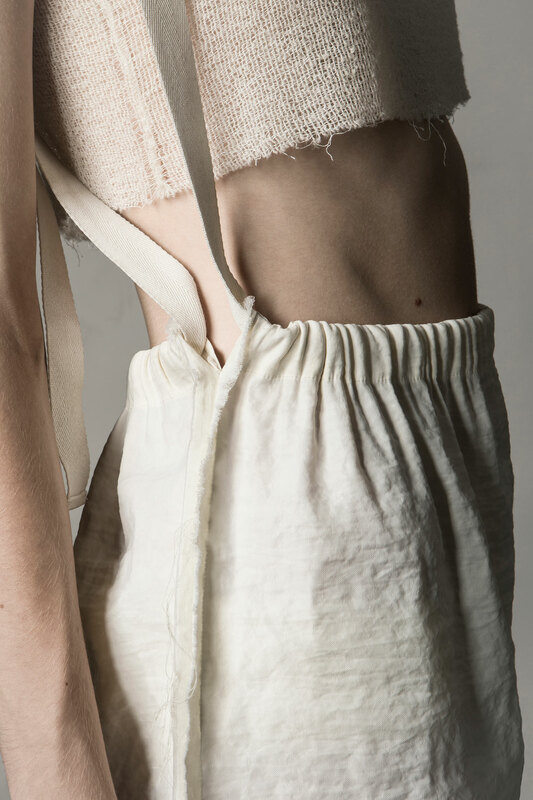 There is a whole new gene pool of designers out there that seem to pay no attention to the laws of cut-and-stitch or even to those of physics, for that matter. 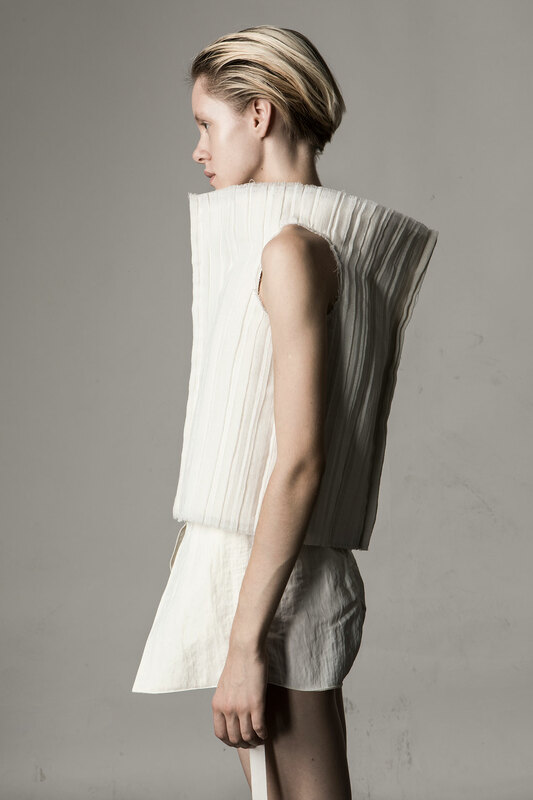 Transcending the limits between art and fashion, twisting the rules to create something authentic and, in some sense new, is a challenge that is frequently executed or at least attempted but hardly ever mastered – a quality that has set apart a handful of designers, like Issey Miyake, Alexander McQueen and Dries Van Noten. 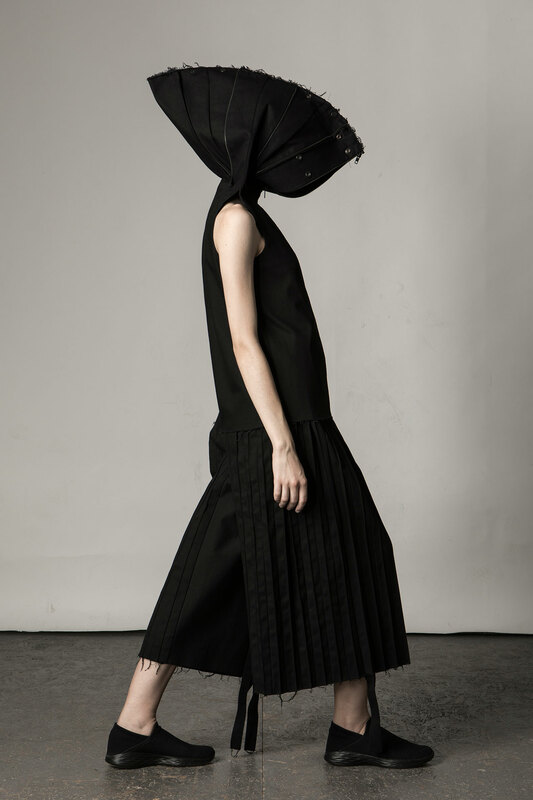 That is, until the appearance of Irina Dzhus, a Ukrainian designer and stylist who, in 2010, launched her own conceptual womenswear brand, DZHUS. 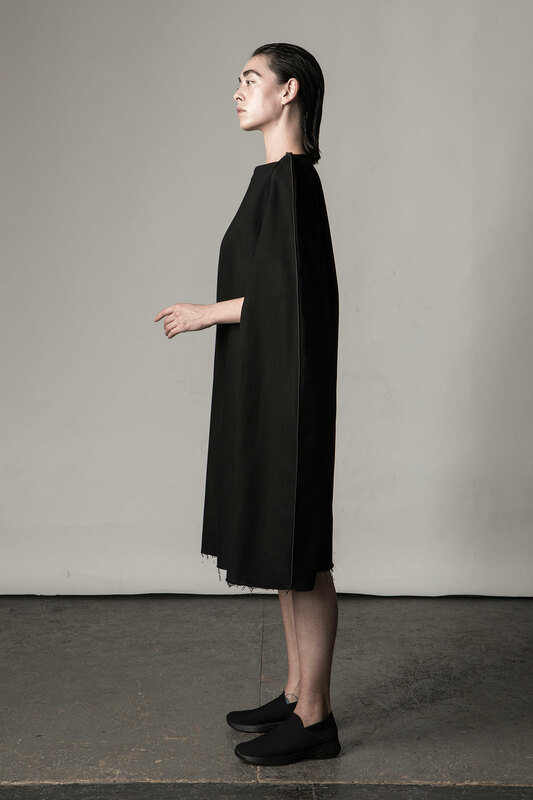 It sure takes guts, as the Americans say, to dare stand out in such an overpopulated business, but this is where the beauty of this particular business lies: In fashion, if you’re good, you’re going to get noticed. 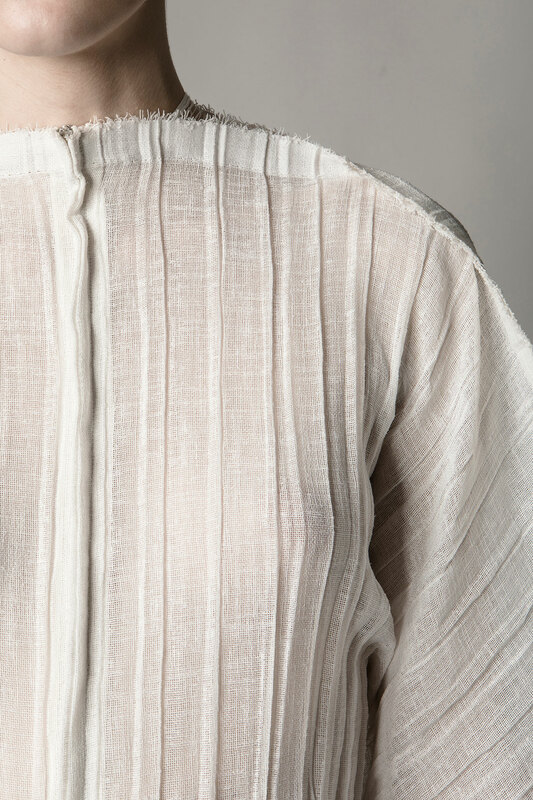 And appreciated. 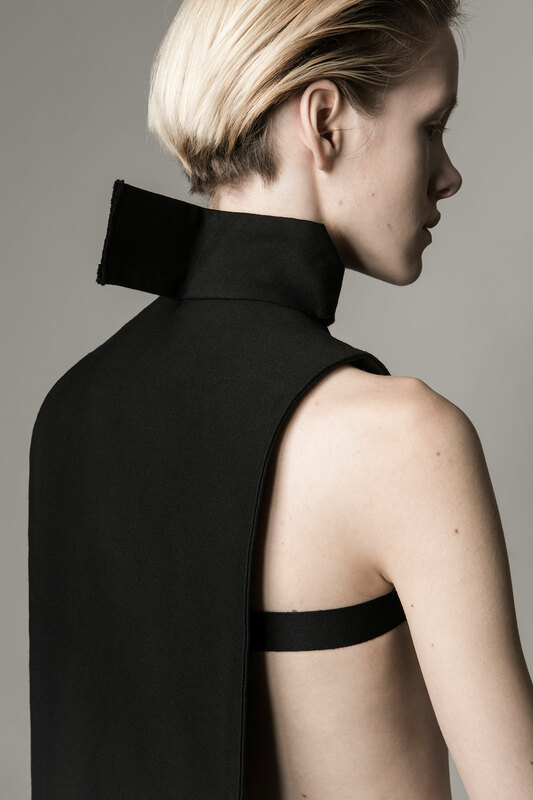 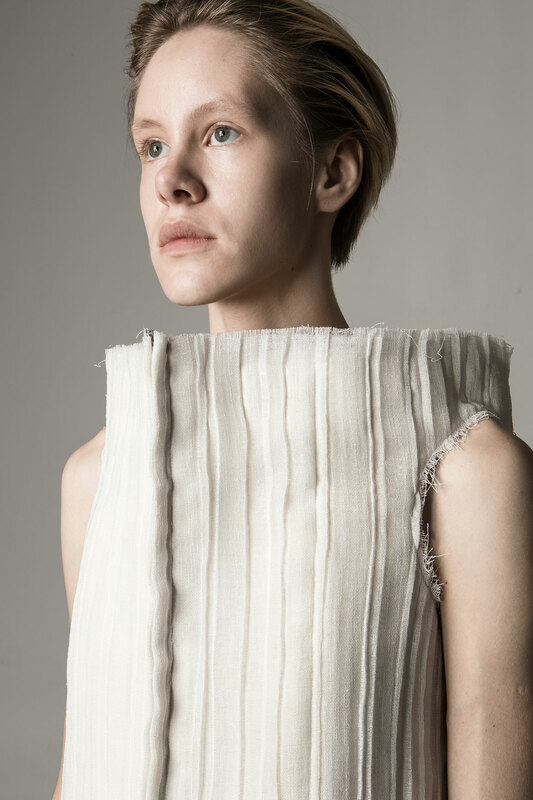 Short-listed for the International Woolmark Prize in 2015, DZHUS has since rightfully found its place at Paris Fashion Week. 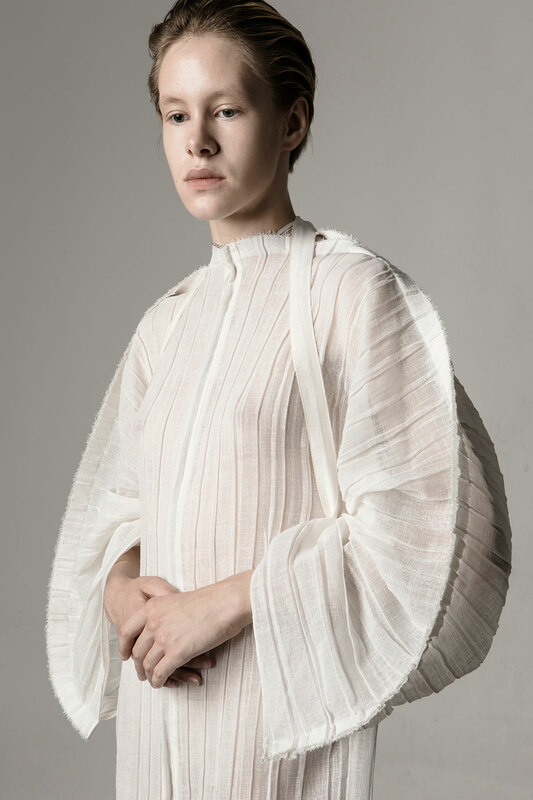 For her collections of dresses, coats, trousers and even swimwear, Irina does not treat garments as pieces of clothing but more like pieces of a puzzle making the wearer re-think the whole outfit. 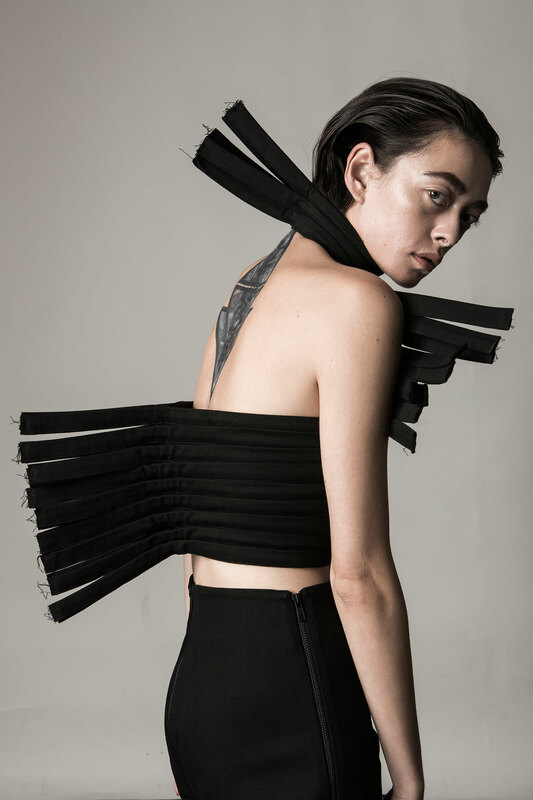 These are in fact wearable sculptures that re-imagine the shape of the body, using it as part of the whole proposition that they imply: Avant-garde yet utilitarian, with innovative cuts, these multifunctional transformer garments carry austere industrial aesthetics that soften up in the blink of an eye, kind of like a moth developing into a butterfly but ever evolving, ever transforming. 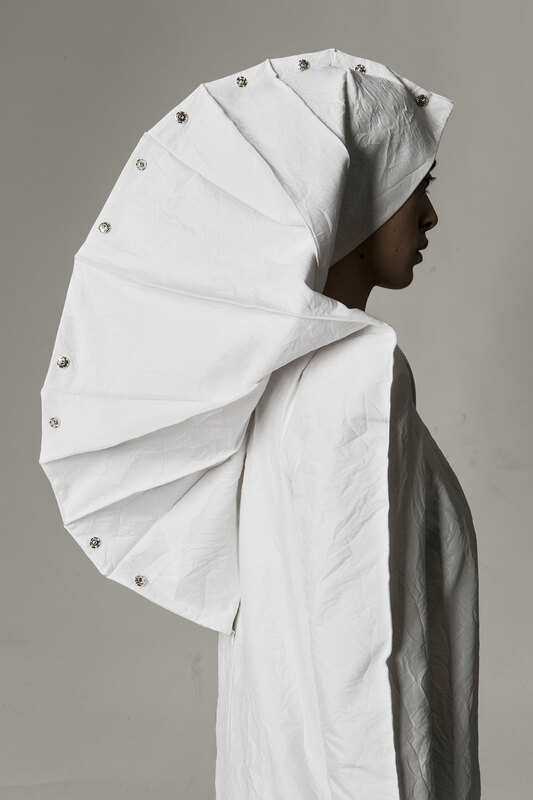 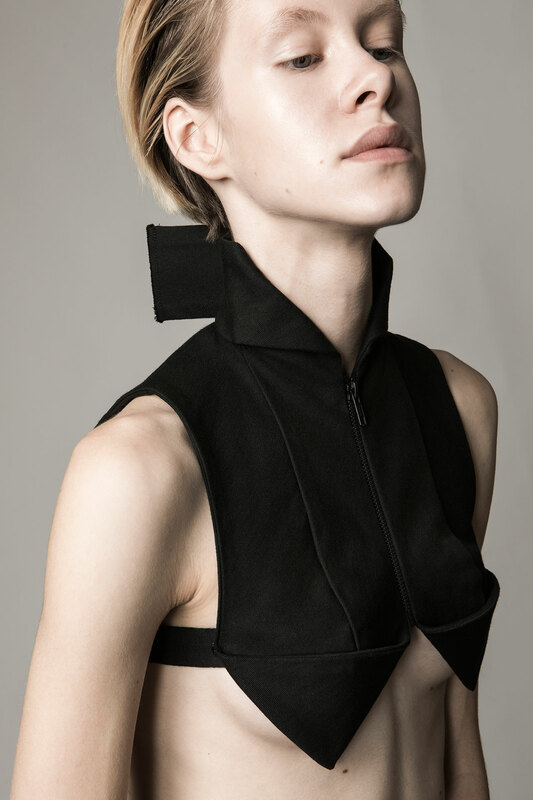 As the designer sees it, what she creates is a perfect, protective shell for the wearer’s distinctive inner world, a shell of uncompromised quality, wearability and comfort. 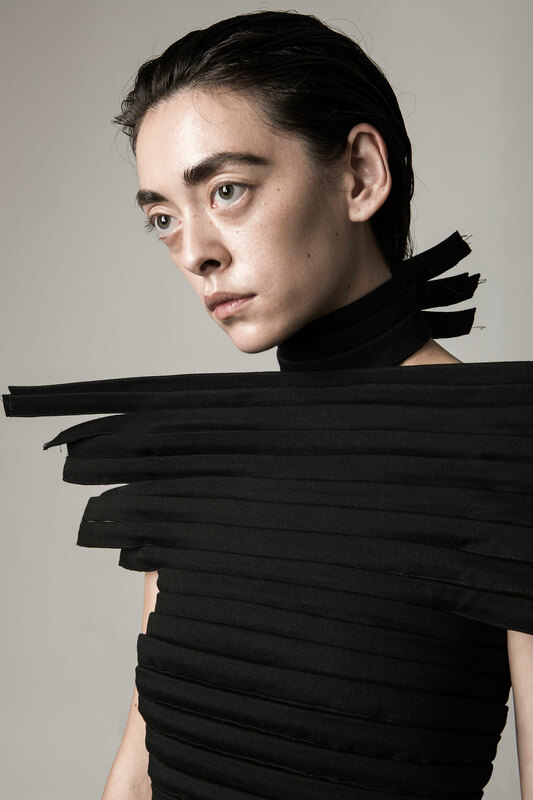 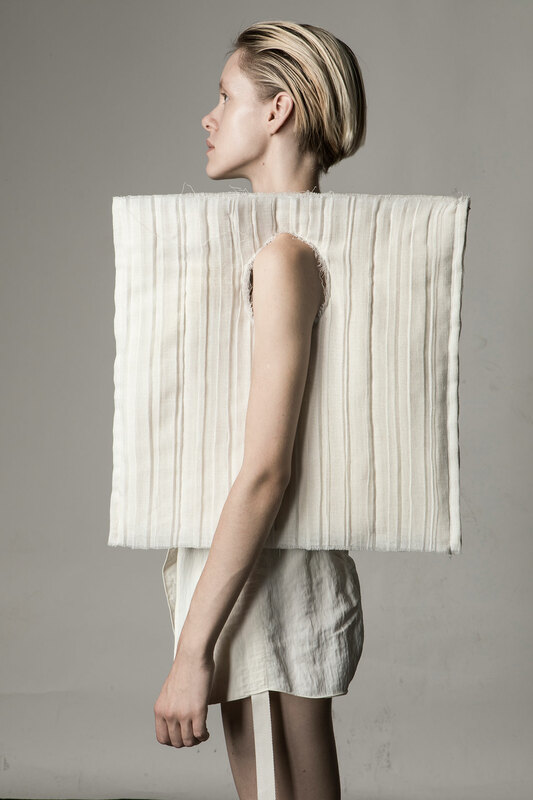 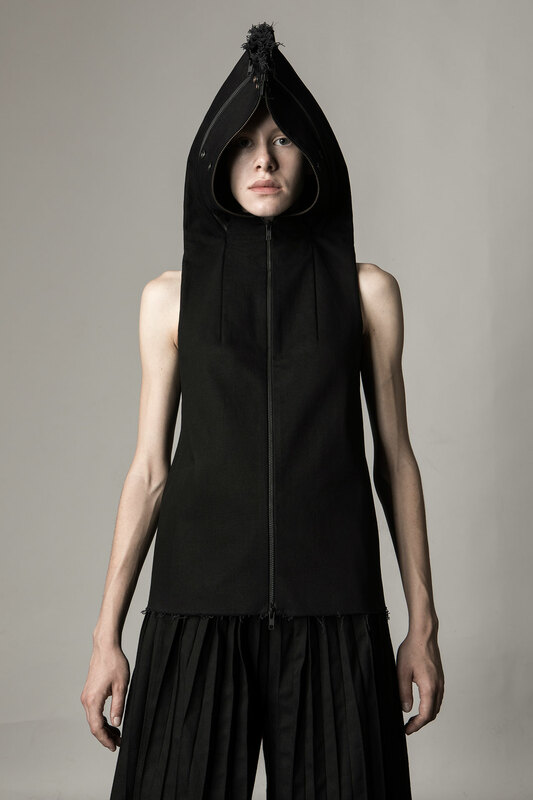 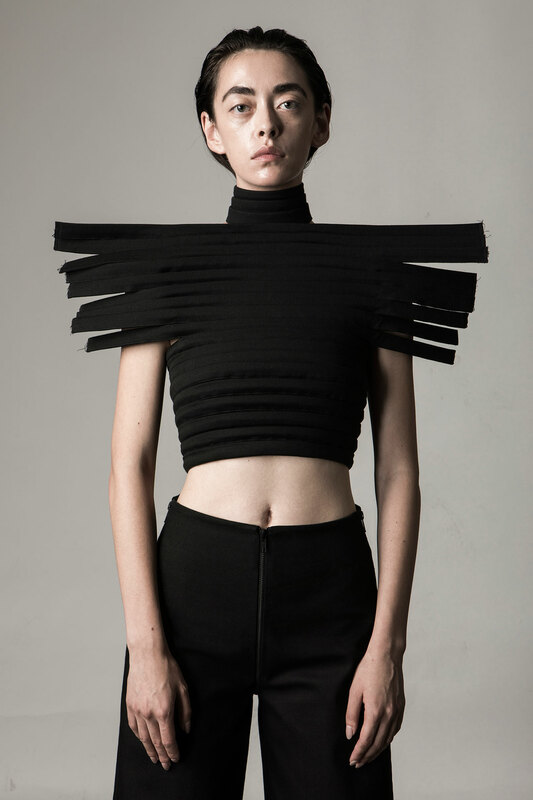 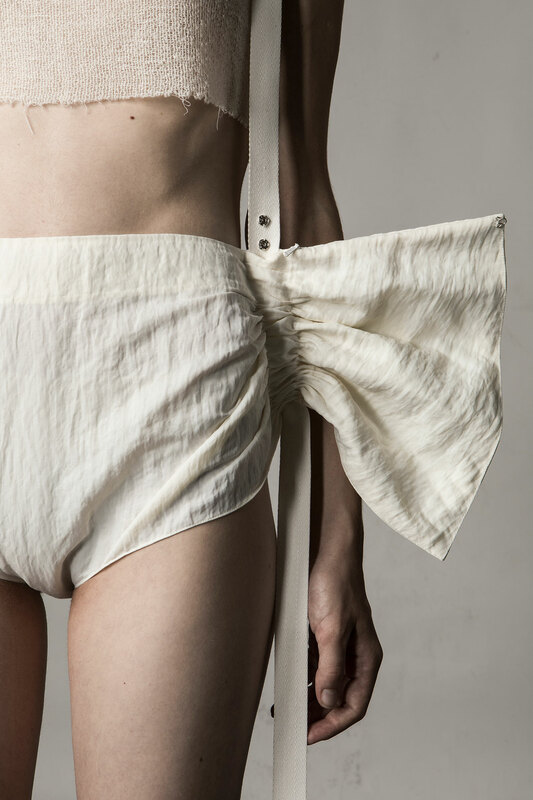 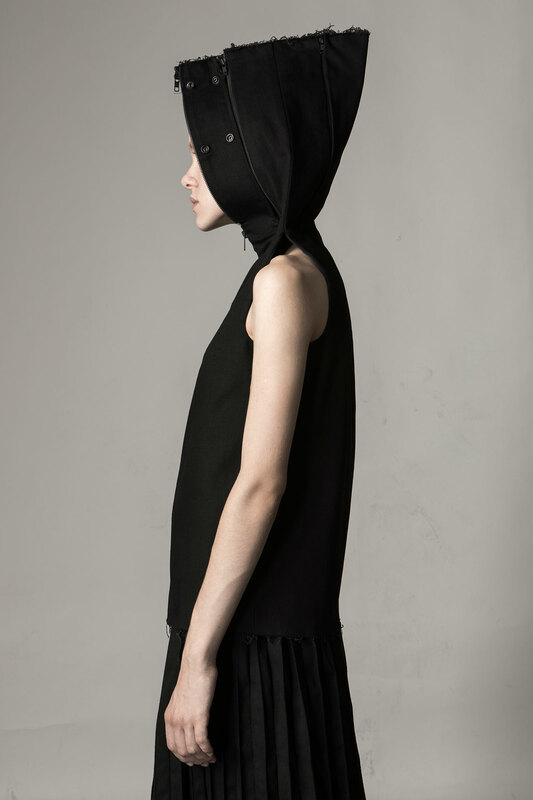 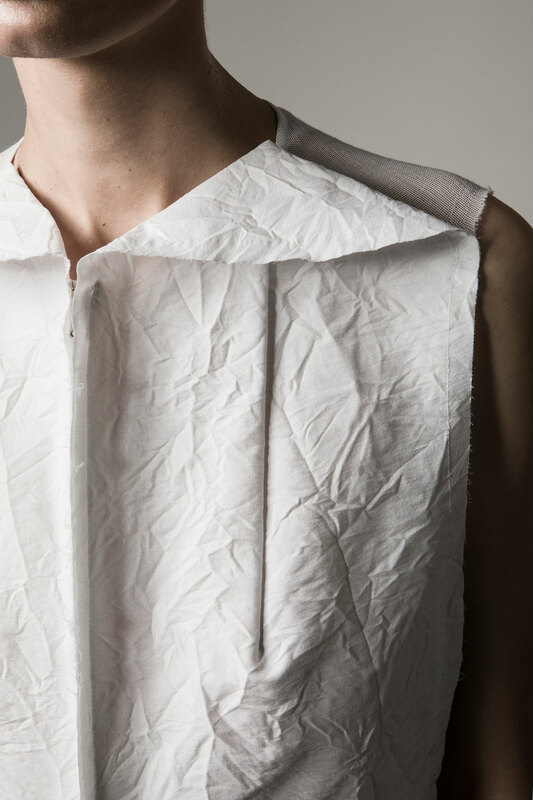 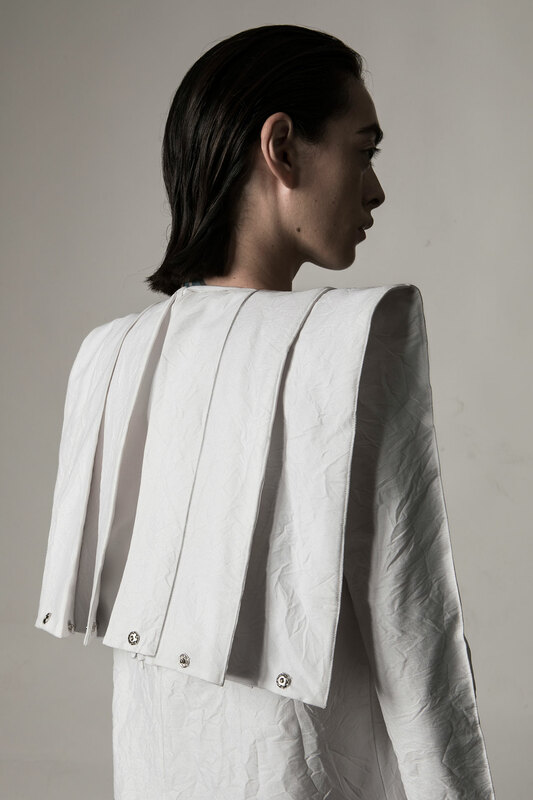 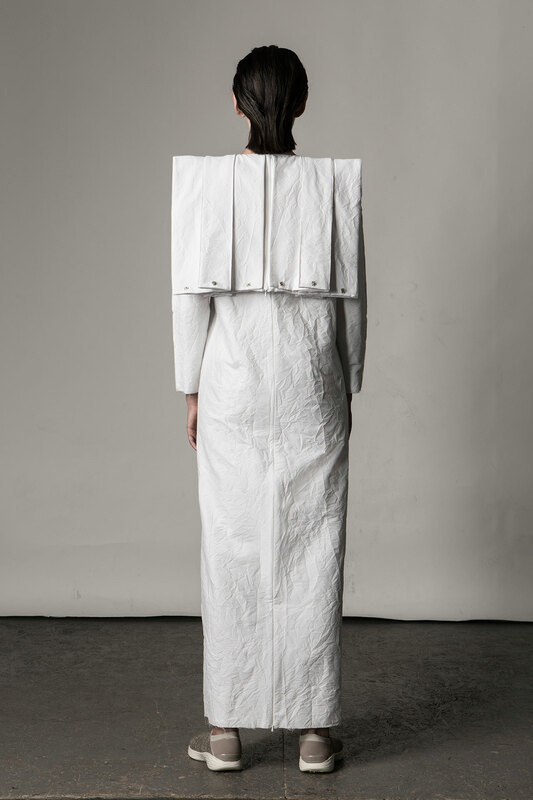 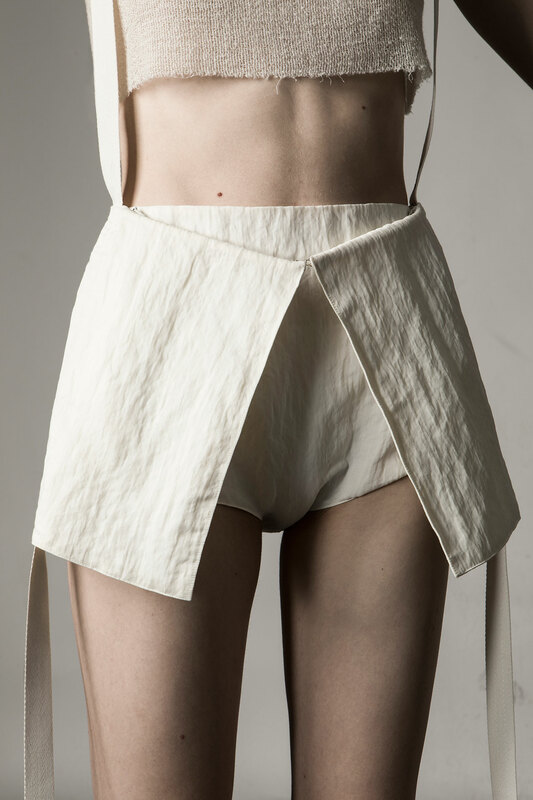 The brand’s key values of consciousness and humanity through the use of ethical manufacturing and cruelty-free materials seem to also pervade DZHUS’ SS19 collection entitled 'Process'. 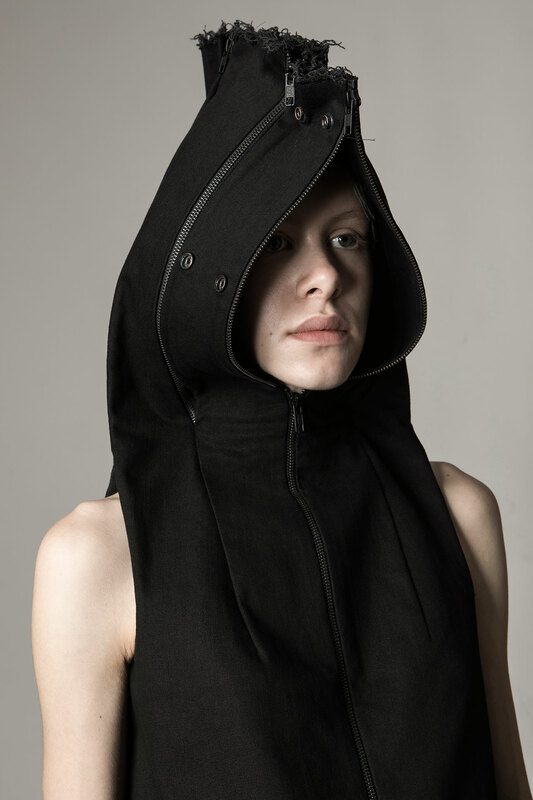 Led by black and off-white non-colours, the line’s dedication to the process of apparel manufacturing is apparent in every piece, this time, even more adaptive to their wearers’ preferences and changing circumstances: A pair of trousers instantly turns into a jacket, a bag is also a skirt, a round and voluminous hood folds itself into a sleek and minimal collar. 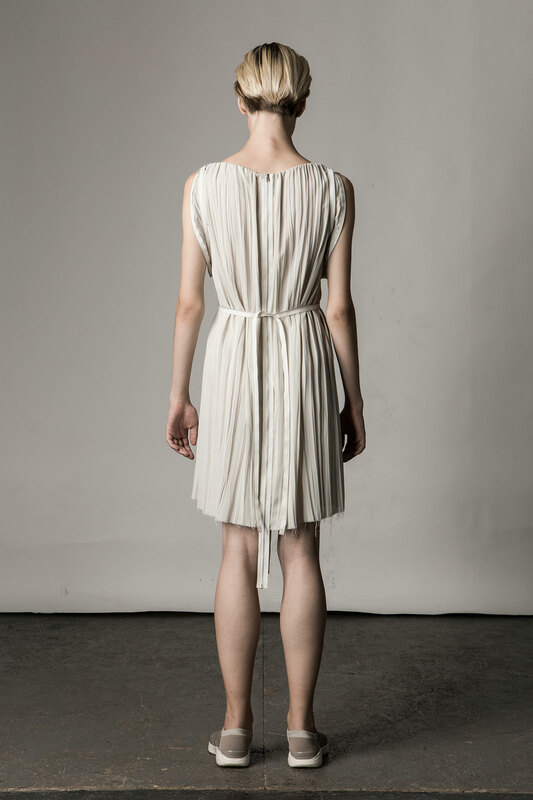 A caryatid statue can transform into a new age fashion warrior and an archetypical kimono can become a contemporary pleated dress. 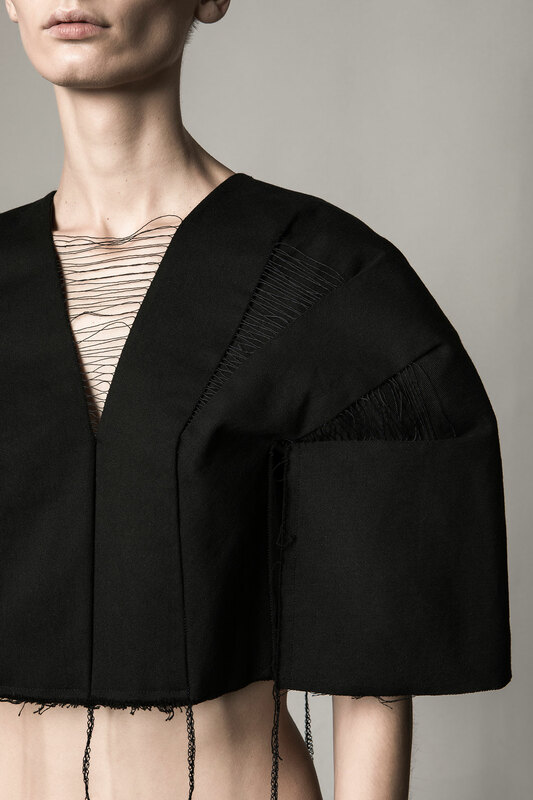 The process stated in the name of the collection seems to be in an ever-evolving shape since exposed threads and seams create a feeling of unfinished mock-ups, the prototypes often used in apparel manufacturing. 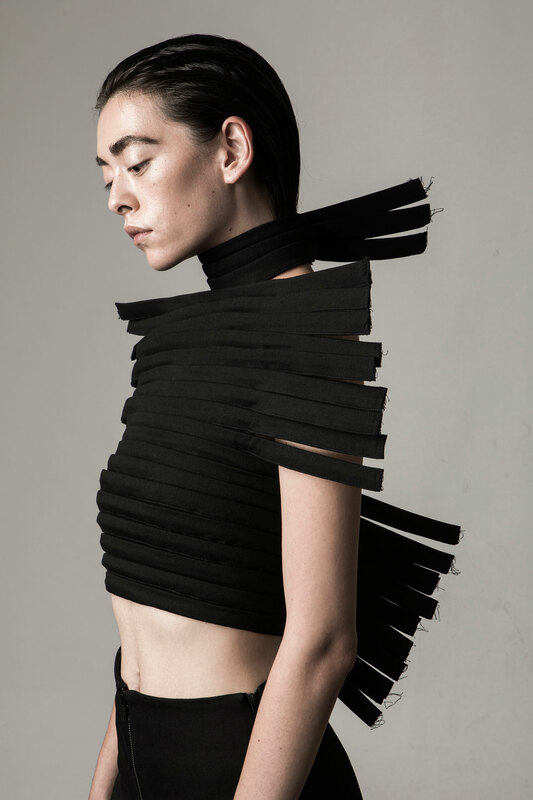 The designer finds her heart closest to this stage of creation, wishing it to never end. 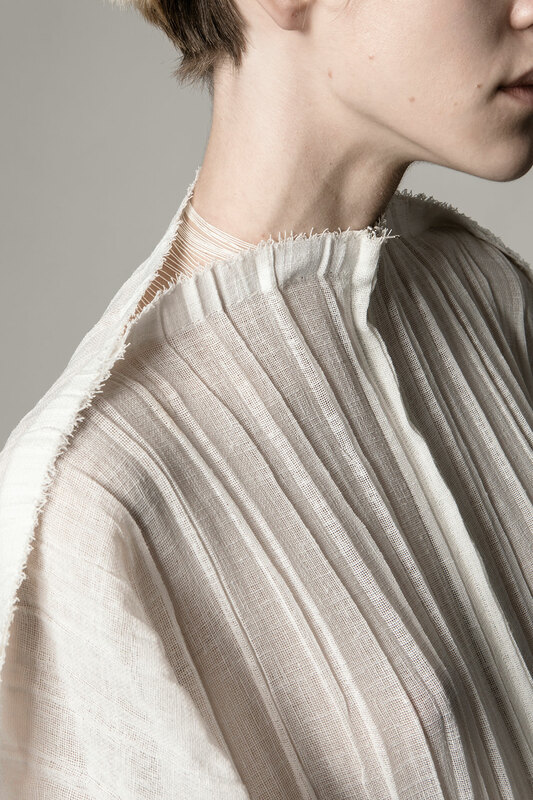 For a designer, the end of the creative process is when a garment is deemed perfect, complete, all of its details are in place, and it is ready to be worn. 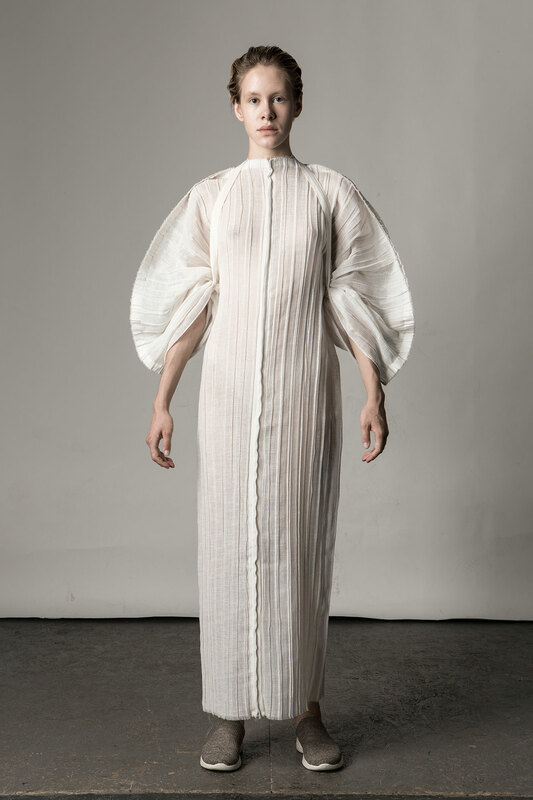 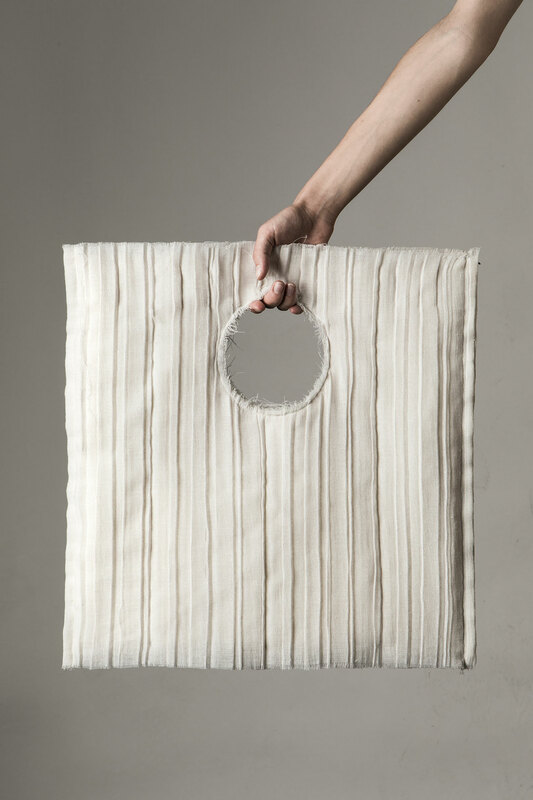 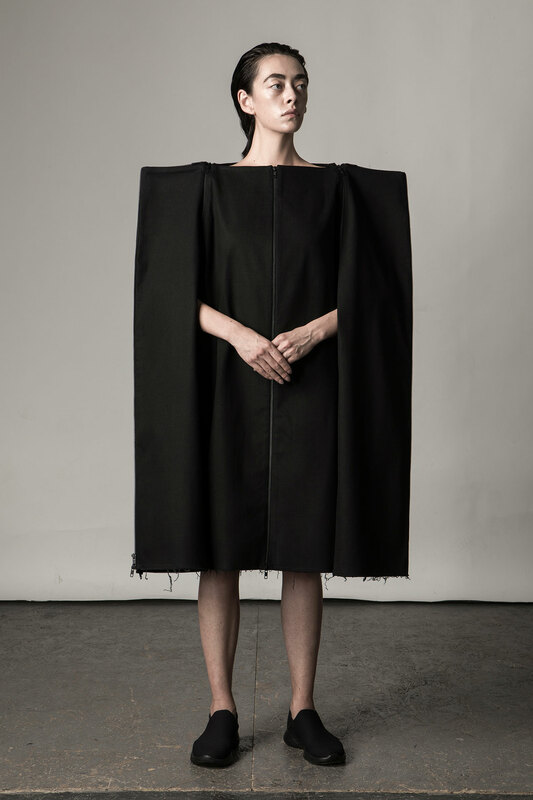 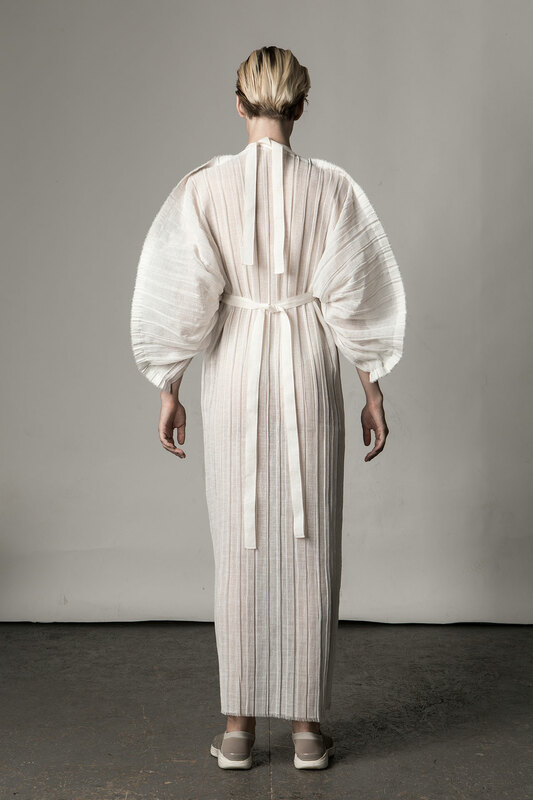 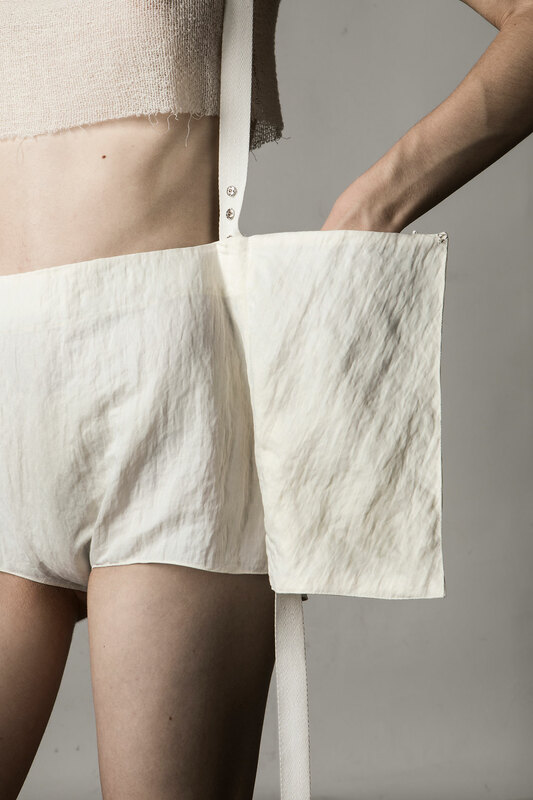 But DZHUS is not one to like full stops, opting rather for the imperfection of a garment that seems almost to be “in progress”, like an unfinished love story between designer, textile and wearer.